The red arrow points to the village of Mamaka, where we finished our first school. The green arrow in the north points to Fadugu where we finished our second school. The blue arrow points to Gofor in the southeast where completed our third school. The purple arrow points to Gbendembu where we finished our fourth project, Teacher’s Quarters. The turquoise arrow points to the village of Magbaimba, our fifth project which was rebuilding a roof for the primary school. 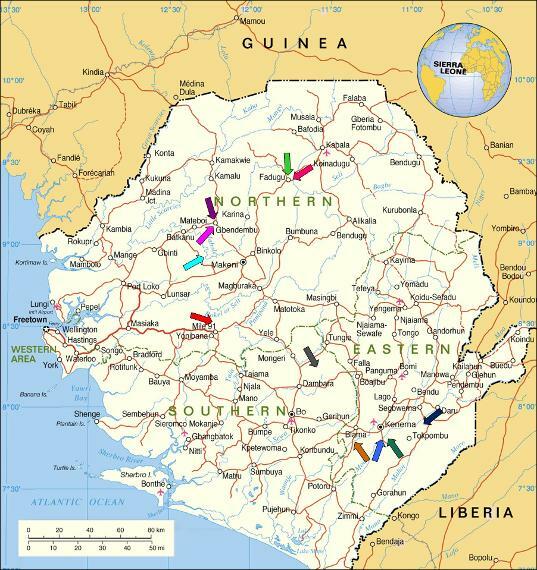 The grey arrow in the center of the country points to the village of Kenema-Blango, our sixth project where we partnered with another NGO to help complete a school. The blue-green arrow also points to Gofor; we revisited Gofor for our seventh project to provide new school furniture. The navy arrow points to the site of our eighth project where we helped the village of Pellie construct a Court Barrie (community center). The lavender arrow points to Gbendembu also; this is the site of one of our ongoing initiatives, Project GLOW. Project GLOW has raised scholarships for 120 female Secondary Students (10th-12th Grade). The pink arrow points to Fadugu, one of the sites of our very earliest school buildings. Our second project in Fadagu was constructing a community library about 10 minutes from that school. The dark-orange arrow points to Bandawoh where we are building a large junior secondary school (7-9th grade). Hit early during the Rebel War, this village has been without a secondary school building for 20 years.